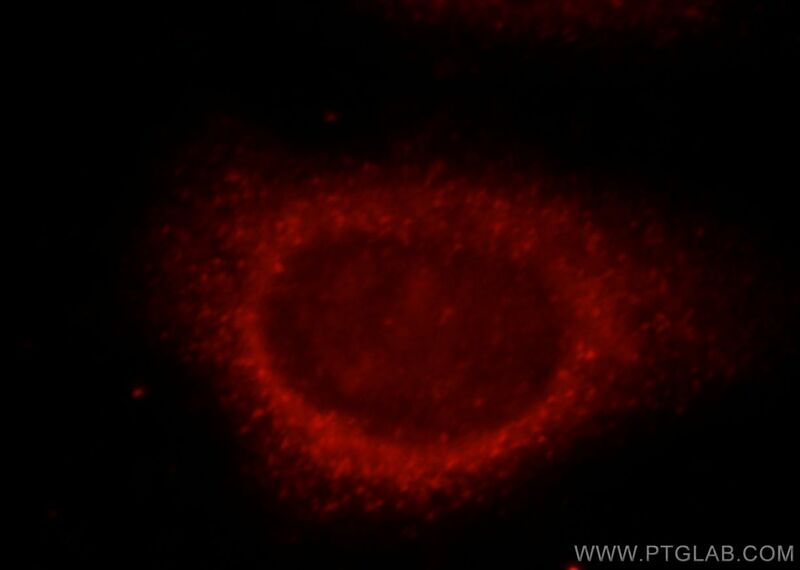 Immunofluorescent analysis of HepG2 cells, using MAP1LC3A antibody 18722-1-AP at 1:25 dilution and Rhodamine-labeled goat anti-rabbit IgG (red). 1X10^6 HeLa cells were stained with 0.2ug LC3A-Specific antibody (18722-1-AP, red) and control antibody (blue). Fixed with 90% MeOH blocked with 3% BSA (30 min). Alexa Fluor 488-conjugated AffiniPure Goat Anti-Rabbit IgG(H+L) with dilution 1:1000. LC3A, also named as MAP1LC3A, LC3, MAP1ALC3 and MAP1BLC3, belongs to the MAP1 LC3 family. LC3A is one of the light chain subunits and can associate with either MAP1A or MAP1B which are microtubule-associated proteins that mediate the physical interactions between microtubules and components of the cytoskeleton. In cell biology, autophagy, or autophagocytosis, is a catabolic process involving the degradation of a cell's own components through the lysosomalmachinery. It is a major mechanism by which a starving cell reallocates nutrients from unnecessary processes to more-essential processes. Two forms of LC3, called LC3-I (17-19kd) and -II(14-16kd), were produced post-translationally in various cells. LC3-I is cytosolic, whereas LC3-II is membrane bound. The precursor molecule is cleaved by APG4B/ATG4B to form the cytosolic form, LC3-I. This is activated by APG7L/ATG7, transferred to ATG3 and conjugated to phospholipid to form the membrane-bound form, LC3-II. The amount of LC3-II is correlated with the extent of autophagosome formation. LC3-II is the first mammalian protein identified that specifically associates with autophagosome membranes. (PMID:11060023) MAP1LC3 has 3 isoforms MAP1LC3A, MAP1LC3B and MAP1LC3C. MAP1LC3A and MAP1LC3C are produced by the proteolytic cleavage after the conserved C-terminal Gly residue, like their rat counterpart, MAP1LC3B does not undergo C-terminal cleavage and exists in a single modified form. 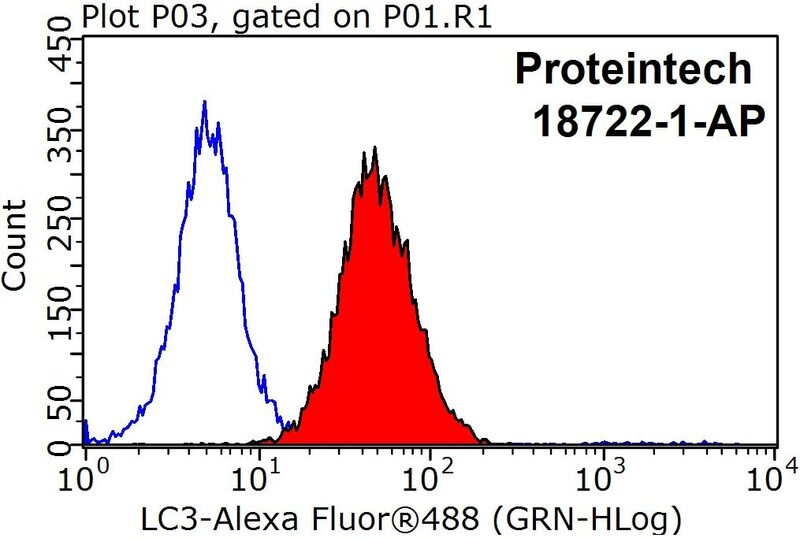 (PMID:12740394 ) This antibody is specific to LC3A.It recognize both LC3A-I and LC3A-II. Connexin 31.1 degradation requires the Clathrin-mediated autophagy in NSCLC cell H1299. Promotion of Pro-Apoptotic Signals by Lysosomal Photodamage: Mechanistic Aspects and Influence of Autophagy. 7-Acetylsinumaximol B Induces Apoptosis and Autophagy in Human Gastric Carcinoma Cells through Mitochondria Dysfunction and Activation of the PERK/eIF2α/ATF4/CHOP Signaling Pathway.